Because of major storm and river damage to the Greenfield Mills area caused by Agnes in 1972, and the destruction of the bridge that crossed the Monocacy River at that time, the starting point for this Trail is Park Mills Road bridge, a few hundred yards south of Greenfield Mills. There is very easy access to the Monocacy, including a boat ramp, under the Park Mills Road bridge. Still, for the more adventuresome, the first few hundred yards of the trip from Greenfield Mills Road are worthwhile, so I will describe both starting points for this delightful trip. This pleasant 3 hour route takes you 4 miles down the Monocacy River to the Potomac and thence 5½ miles more to White’s Ferry. The early history of western Montgomery and adjacent Frederick Counties made important use of the Monocacy and Potomac Rivers as transportation routes. The Potomac route to the west connected the coastal seaports to the Ohio Valley, and the Monocacy was the principle Indian trail from New York State and Upper Canada into the Yadkin country of North Carolina. The Indian name “Monoquacy” means “many big bends.” (The river was also called “Quattero” or sometimes “Coturk” before its present name became generally accepted by white settlers who began arriving in some numbers in the early 1700’s.) A number of rock dams used for catching fish in Colonial days – and in prehistoric times by Indians – may be observed in the Monocacy as well as the Potomac. River crossings were important in determining the locations of roads, and fords became the sites of later bridges. As transportation corridors, the rivers were strengthened by the coming of the canals, and later railroads and highways threaded the same corridors, connecting and revitalizing earlier settlements. All this today is frequently obscured, not only by the changing of routes, but by the landscaped effect that is the result of making a working canal into a park. Today, it requires research and imagination to recover ancient Indian fishing wiers and crude dams that have survived flood waters, the sites or ruins of mills, furnaces and other water-powered early industry –but it is all there, as proposals to build in the river flood plains, to dam the Monocacy, or to construct major works along the Potomac have had to recognize. Among other points of special interest you will see are the Johnson Iron Furnace, the Baltimore & Ohio Railroad Viaduct over the Monocacy, and the Chesapeake & Ohio Canal aqueduct, In contrast to some nearly forgotten traces of the past, you will pass the modern PEPCO electric power plant on the left bank of the Potomac near Dickerson. Of special interest to naturalists are the numerous wading birds to be seen along the Monocacy and Potomac shores, including Great and Little Blue Herons, Black-crowned Night Herons and Snowy Egrets. You may enter the Monocacy at the Greenfield Mills Put-In. To reach the river at this point, turn north off Maryland Route 28 onto Greenfield Road approximately 1¼ miles west of the Monocacy River bridge. The turn is immediately past the Forest Grove United Methodist Church. Proceed ¾ mile down the rural road to the point where the road turns left by 90 degrees. This area is where the Greenfield Mills community used to be located. There is limited parking on a small asphalt apron where the road pavement ends. The bridge that once crossed the Monocacy at this point was washed out during Hurricane Agnes in 1972. Canoes must be carried 50 yards or so to water’s edge along a heavily grown-up foot trail. Alternatively, you may wish to use the Park Mills Put-In, a nearby downstream access to the Monocacy River under the south side of the Park Mills Road bridge. This high modern bridge was constructed to replace the old washed out bridge at Greenfield Mills. To reach the bridge, turn north off Maryland Route 28 onto Park Mills Road, about ¼ mile west of the Monocacy River bridge. Drive about one mile on Park Mills Road, turning left into the parking area just before crossing the concrete Park Mills Road bridge. The boat ramp is immediately under the bridge. The Greenfield Mills Post Office, established here (see #1, above) in 1836 took its name from a four-story stone grist mill built sometime prior to 1831 for a Mr. Isaac McPherson of Baltimore. When the McPherson estate was settled in 1831, the mill was described as having four pairs of 6-foot burrs, producing 80 to 100 barrels of flour per day, and having “pit machinery all cast iron.” Over the next 70 years until the mill was destroyed by fire near the turn of the century, it underwent several changes in ownership and periodic improvements in its machinery and capacity to keep pace with expanded crops growing in the surrounding rich farmlands. An 1872 atlas refers to the “celebrated ‘High Grade Flour’” produced at the mill. The 6-foot descent in the Monocacy’s water level at nearby Griffith Falls provided “two to three times” the amount of water needed to power the mill, according to an 1858 sale offer when the estate of then-owner Meredith Davis was settled. Today, the location of the old mill race is still evident, but the ruined foundation of the mill itself has disappeared from casual view. 300 to 400 yards downstream from the put-in point, V-shaped ripples stretching across the river reveal the underwater location of a loose-rock dam used in Colonial times, and probably earlier by Indians, to trap fish. Two more such V-dams may be observed approximately 100 to 150 yards apart at a point some 400 yards below the first dam mentioned above. Fishing in the Monocacy has nourished the bodies and souls of men from the earliest times up to the present. Just upstream from the Route 28 highway bridge (1/2 hour of easy paddling below the put-in point), Furnace Branch enters the Monocacy on the left. The shallow crossing of the Monocacy at this point is known as Furnace Ford (canoes should bear to the right to negotiate the Class I rapid which lies immediately beyond this ford). Both the ford and the tributary stream take their name from the Johnson Iron Furnace which was situated ¼ mile up Furnace Branch. Today, an overgrown slag heap marks the location of the stone furnace which was built into the hill on the north bank of Furnace Branch where the old road from the junction of the Monocacy River and Route 28 crosses it. The furnace was built in 1787 and operated until 1805. The decision to locate it here probably reflected the need for enormous quantities of wood (estimated at 400 cords per week!) to fire the furnace. This wood (reduced to charcoal) came from the extensive forests around Sugarloaf Mountain; the depletion of the forests after nearly 20 years of cutting may have been the deciding factor in the closing down of the furnace. The iron ore was hauled by wagon and barge from the Point of Rocks area some five miles to the west. Lime, another essential in iron making, was burned from local limestone at a kiln located farther up Furnace Branch; the stream itself powered the waterwheel to operate the bellows in this “cold blast” furnace. The Johnson Furnace was one of five ironworks operated by the four Johnson brothers (the better-known Catoctin Furnace near Thurmont was another). One of the brothers, Thomas, had the distinction of being the first elected Governor of the State of Maryland. This impressive bridge is another 20 minute leisurely paddle downstream from the highway bridge. Because of its length (700 feet) and height (75 feet), trains pass over it at reduced speed. Originally (about 1870) the viaduct was lower, resting on three piers consisting of Seneca sandstone, Washington County limestone, and white quartzite quarried from Sugarloaf Mountain some four miles northeast. Three more piers were added about the turn of the century when the entire structure was raised and reinforced. You will note the concrete and brickwork atop the earlier stone piers, dating from this later reconstruction. The first, third and fifth piers (counting from the east side) are the original construction. It is well worth your while to beach the canoe for a brief tour on foot to inspect this remarkable structure. 560 feet long, and supported by seven masonry arches, the aqueduct was built between 1829 and 1833 using white quartzite from nearby Sugarloaf Mountain. Skilled stonemasons (about one hundred of them, by account) were imported from Ireland especially for this work, and a stone plaque commemorating the engineers may be seen on the parapet at midpoint on the upstream side. The bed of the aqueduct is now dry, but the structure is quite sound because of a major renovation to this historic treasure, completed in May, 2005. Many thousands of C & O towpath hikers and bikers cross the Monocacy on it every year. This is a local name for the wide bottomlands north of the Monocacy near its confluence with the Potomac. 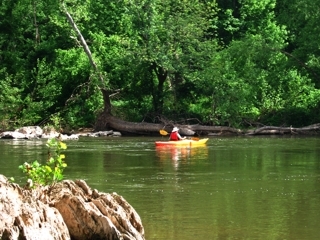 From ancient times, the Potomac and Monocacy were used as canoe and hunting trails. 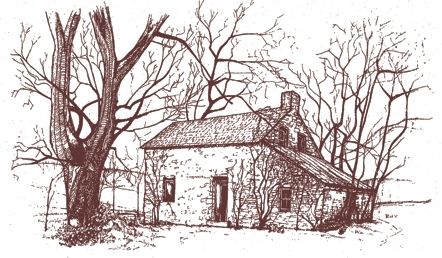 The famous French fur trader, Martin Chartier, with his Indian wife, had already settled at the mouth of the Monocacy when, in 1711, the Swiss traveler, Baron Christoph de Graffenreid, visited the area and declared that there was “no more beautiful sight in the world” than Sugarloaf Mountain. (He was promoting settlement.) In 1712, Tuscarora Indians came to settle in the fork of the Monocacy and Potomac after leaving their former abode in North Carolina; Tuscarora Creek and Tuscarora Mountain a few miles west still attest their brief presence in the area, nearly three centuries ago before they continued their northward way into Pennsylvania. The major portion of this electric generating plant was built in the 1950s as a 575 Mw coal fired plant. One of the most advanced in the world when constructed, it has undergone numerous rebuilds and expansions, including the addition of gas turbines. You will note a significant change in water temperature as the warm flow from the plant’s cooling system enters the cooler mainstream. Recently, new pollution control facilities have been installed at the plant, including a 400 foot high scrubber stack. The new emissions stack is designed to remove a high percentage of many pollutants. Approximately two miles downstream from the PEPCO plant, this shallow crossing of the Potomac was used by General Lee’s Army of Northern Virginia in September, 1862, at the beginning of the Antietam campaign. In July, 1864, General Jubal Early and his Confederate “foot cavalry” used it to escape into Virginia after an unsuccessful raid on Washington. The ford is located just below the rocky bluffs touching the river on the Virginia shore as the river bends to the right going downstream. Several fish traps in the form of loose rock dams are to be found in the channels between Mason Island and both the Virginia and Maryland shores. They are discernible as V-shaped lines of ripples, often with a mound of sand and debris which has built up at the downstream apex of the V. In two or three instances, clumps of weeds are growing out of these mid-channel mounds. Sport fishing in this section of the Potomac is still rated “good,” but according to early accounts, the river was teeming with fish. The importance of fish as a source of food for prehistoric Indians living in this area (as well as Colonial settlers) is often overlooked. NOTE: The rock dams in the Potomac are most easily discernable at low water. When the river level at Little Falls approaches 3.0 feet, the ripples over the dams are clearly visible. River levels are reported in Washington, DC daily newspaper “weather” sections. This is the only Potomac River ferry now operating along the whole length of the river from Washington, DC to Cumberland, and it is the only “captive” (cable-guided) fresh water ferry on the East Coast today. Ferry service here is believed to have started in Colonial times, but the earliest documentary evidence records it as Conrad’s Ferry, after Ernest Conrad who operated it from 1836 until the mid-1860’s. Following the Civil War, Colonel “Lije” White took over the operation. White was a former Poolesville resident who had commanded a Virginia Cavalry Battalion during the Civil War. The types of ferry boats used here have evolved over the years from the earliest wooden rafts which were poled across, to the present diesel-powered, steel-hulled “General Jubal Early.” The current ferry was put in service in 1988, with a 15 car capacity. An addition was added in 1996 that increased the capacity to 24 cars. Canoes may be rented at White’s Ferry for $7.50 per hour, or $25.00 for the day. A new service being provided by the White’s Ferry staff would deliver one or more canoes to selected upstream put-in points. Paddlers would then take a leisurely trip back to the ferry. Rates and further information on this service, which requires reservations a week in advance, can be obtained by calling White’s Ferry at 301-349-5200, between the hours of 7:00am and 7:00pm. The rental services are available from May 1 through October 31. To see the old hand drawn Trail Guide site maps for A Canoe Trail (now out of date), please go here.